The Panic of 1907. The Crash of 1929. “Black Monday” 1987. They all fell in October. But is it true? Is October worthy of its blackened name? Today we haul the defendant into the dock… interrogate its record… and render verdict. All the major indexes flash red as we write. The Dow is off 49 points… the S&P is off four… the Nasdaq is off six. But gold caught a fair wind today — up a hale and hearty $14. Uncertainty, be it political, geopolitical or meteorological, appears the dominant note right now. But returning to the question of the hour… is October the great menace it’s alleged to be? Stock market crashes have occurred sufficiently infrequently in history that there is not enough evidence on when they are more likely to occur. Meantime, Yardeni Research proves the average October return over time is 0.4%. A slender gain — but a gain. And Investopedia informs us that more bear markets have ended in October than have begun in October. Downturns in 1987, 1990, 2001 and 2002 all reversed in October. It appears an innocent man has been pitched into infamy… and sent to the gallows under false charges. But if October isn’t the market menace it’s alleged to be, does another month take its place? September’s mischief likewise afflicts the S&P. Bank of America Merrill Lynch strategist Savita Subramanian shows its median September return has been negative… stretching back to 1928. But let us hear no more of Septembers past. Stocks have opened the month in a state of confusion… uncertain of their bearings, or direction of travel. But stocks misstepped again today. Of course we’re only one week into the month. But the three weeks ahead are potentially rows of dragons’ teeth. Yet despite all logic, all reason, volatility remains fixed on low settings. The signs are everywhere that the stock market is in a subcritical state with the potential to go critical and melt down at any moment… The problem with an out-of-control forest fire or a market meltdown is that it’s difficult to contain. Forest fires can start in small areas and quickly spread to hundreds of thousands of acres. Likewise, there’s no guarantee that a stock market meltdown will be contained to stocks. Panic can quickly spread to bonds, emerging markets and currencies in a general liquidity crisis, as happened in 2008. Words to the wise, perhaps, for the wise. 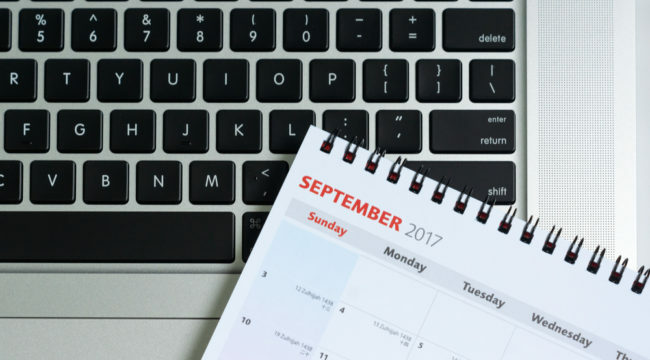 Do we hazard our own prediction of September doom? Here at The Daily Reckoning, our curiosity is strong… but our commitments weak. “Sometimes right… sometimes wrong… and always in doubt… we just try to connect the dots,” in the words of our founder Bill Bonner. 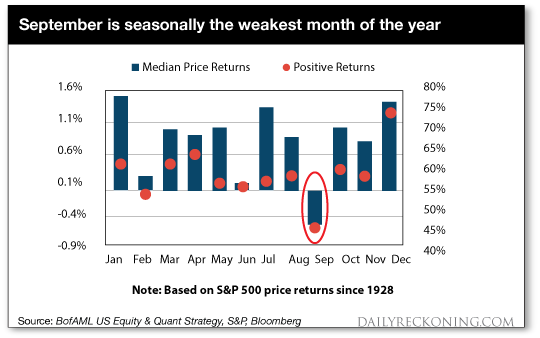 We are nonetheless duty-bound to remind you that September is one of the most dangerous months to speculate in stocks. July, January, April, November, May, March, October, June, December, August and February.